Since ancient times, wreaths have been used in cultures around the world as symbols of both celebration and mourning. For modern homeowners, wreaths are versatile home accessories that enhance indoor and outdoor decor. Pine wreaths are common front-door decorations at Christmastime, but wreaths made from flowers, fruits and seashells celebrate every holiday and season. Instead of hanging wreaths from purchased hangers, choose cute, clever display methods that reflect your style and personality. 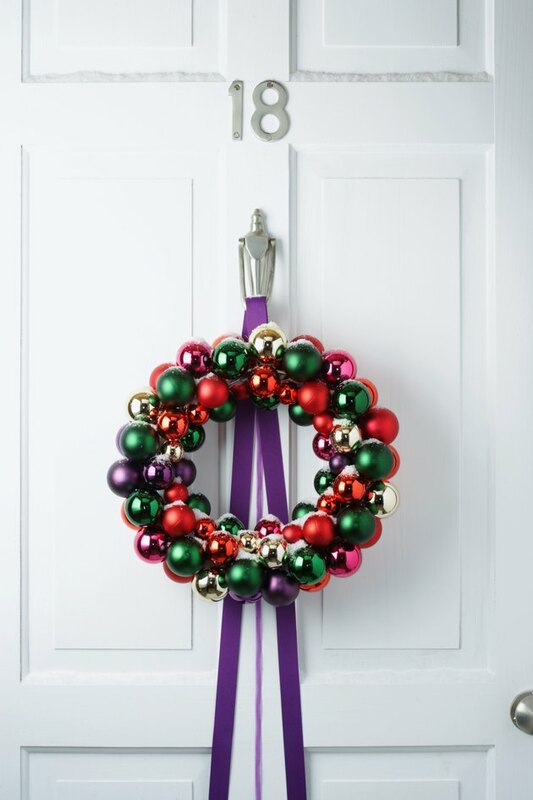 A shiny wreath and bright purple ribbon bring holiday cheer to a simple white door. A front-door wreath welcomes guests and announces the season. To make a simple wreath hanger, cut a piece of wide ribbon that complements the wreath's style. Thread the ribbon through the wreath and tack the ends to the inside of the door. If your door has a knocker, use it as a wreath hanger. Tie the wreath in place with decorative ribbon, allowing strands of ribbon to hang loose. When decorating outdoors, think beyond the porch. Hang wreaths on gates, trellises and lampposts to give your garden a festive feel. In your home's dining room and other formal spaces, artfully displayed wreaths create a sophisticated atmosphere. With a strand of beaded garland, hang a wreath over a large mirror to double its visual impact. Smaller wreaths accent the room's furnishings. Hang tiny wreaths from door pulls on a china closet or buffet; decorate a chandelier with lightweight wreaths hung with ornament wires. To make every seat at your dining table a place of honor, use decorative ribbon to tie a wreath to the back of each chair. If the style of your home is casual and cozy, incorporate country trims in your wreath displays. Use burlap strips, gingham ribbon, rickrack and twine to hang wreaths on walls, windows and doors. Simple hooks fashioned from black or rust craft wire can hang small wreaths from wall pegs or a plate rail. To create a country chandelier, attach flameless candles to a large wreath with floral tape. Fasten four long pieces of ribbon to the wreath spaced evenly around, and then tie the ends together. Hang the wreath horizontally from a beam or ceiling hook. An open staircase is a dramatic architectural element that bridges your home's public and private spaces. Create a wreath display that accents the stairway and draws interest upward. Use garland or ribbon to hang wreaths from the banister. With removable hooks, hang a collection of wreaths on the stairway wall and in the upstairs hallway. For a formal look, choose wreaths of the same style and hang them in an orderly pattern. If your decorating style is eclectic, create a gallery of vintage wreaths and hang them at different heights.